Given the Tuscan roots of the Frescobaldi family, the focus of the menu is unsurprisingly on the rich culinary traditions of this beautiful region of Italy. In the kitchen is Chef Roberto Reatini who was previously at the Michelin starred Zafferano. He has brought a contemporary twist to some great Italian classics to give the food a modern flair. 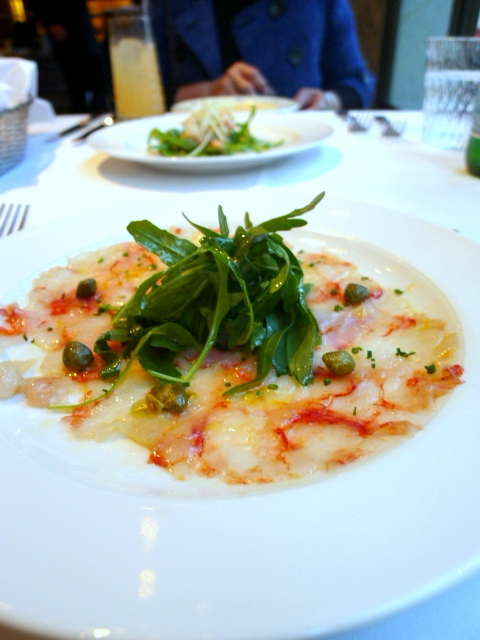 Red prawns carpaccio (£26) was wonderful with a lasting and intensely sweet flavour. Accompanying the prawns were some capers which worked perfectly with the prawns by giving it some acidity. 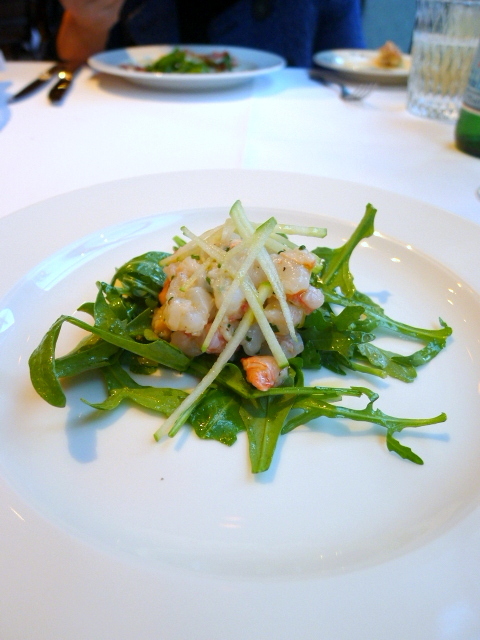 Another seafood starter of langoustine tartar with green apple salad (£25) was also reasonably tasty and fresh, but it didn’t have the same intense sweetness as the prawns. 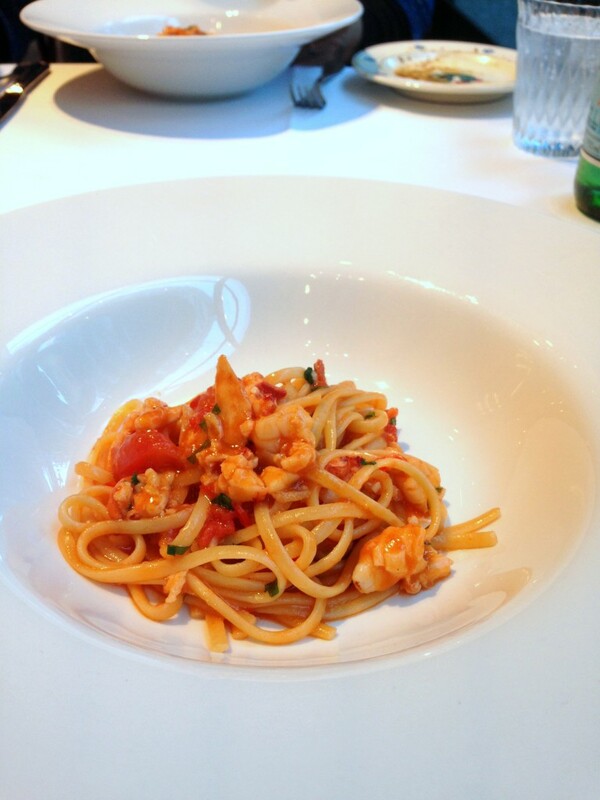 Our pasta dish was the lobster linguini with chilli (£27). This was a beautiful plate of food with perfectly cooked linguini and a beautifully flavoured tomato sauce. There was also a splash of finely chopped parsley running through the dish that added a really nice aroma to it. As for the lobster itself – this was tasty and nicely cooked. This was an excellent dish, although we would have preferred more pieces of lobster. 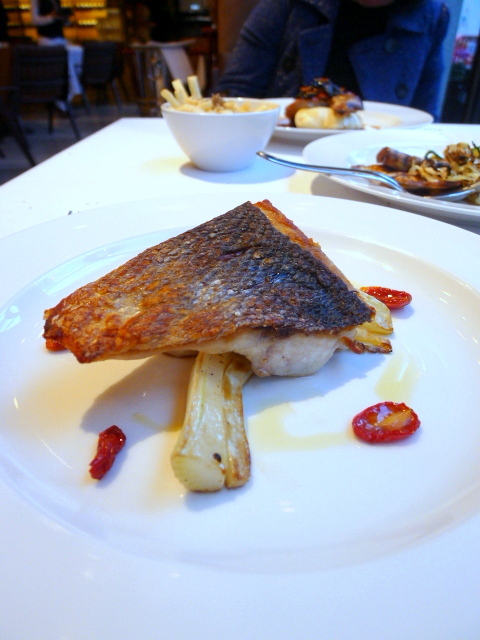 We tried both a fish and meat secondi, the fish being roasted sea bass with fennel. The fish was fleshy, fresh and nicely cooked, and there was a good bite to the fennel. But the dish was almost too simple, and needed another element on the plate – some acidity or a sauce – to bring the dish together and to liven it up. A veal cutlet (£29) proved to be a nice cut of meat and was very tender, albeit well done rather than the requested medium rare. There were also some braised mushrooms on the plate which had a really good flavour but were a touch over seasoned. 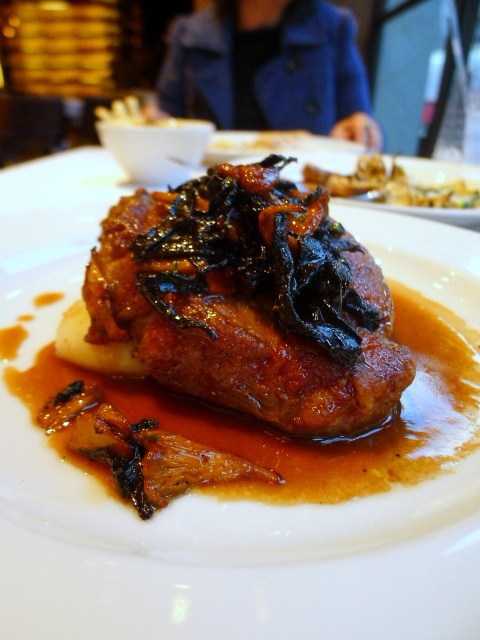 To complete the dish was an accomplished veal jus, nicely reduced with a classically rich intensity. 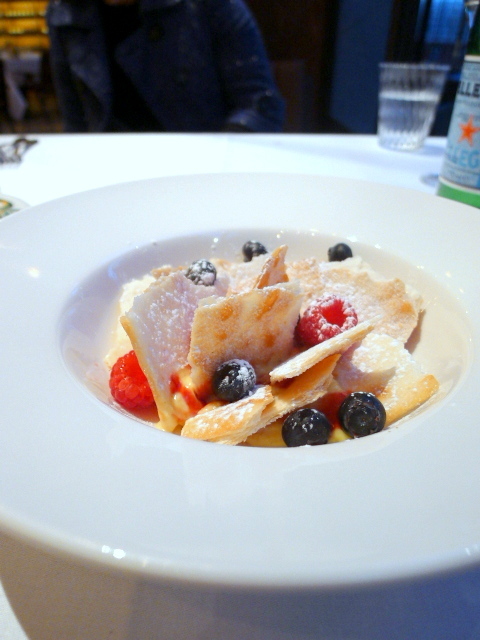 To dessert, and a mille-feuille with raspberries (£9) had been deconstructed and consisted of Chantilly cream in a bowl with thin layers of puff pastry and a sprinkling of raspberries. The Chantilly cream was pleasant, but the winning element was the puff pastry which was excellent as it was light, flaky and very crispy. We would particularly recommend the lobster linguini and the red prawn carpaccio as these were really delicious. 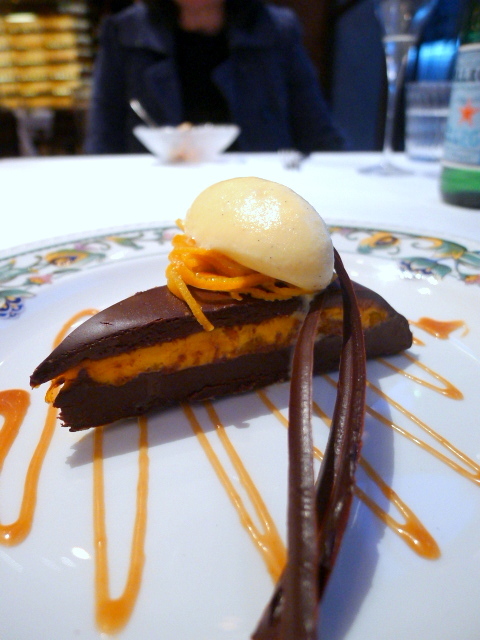 The desserts were wonderful too although the mains we tried could do with a little tweaking. But overall, the food was polished and tasty. 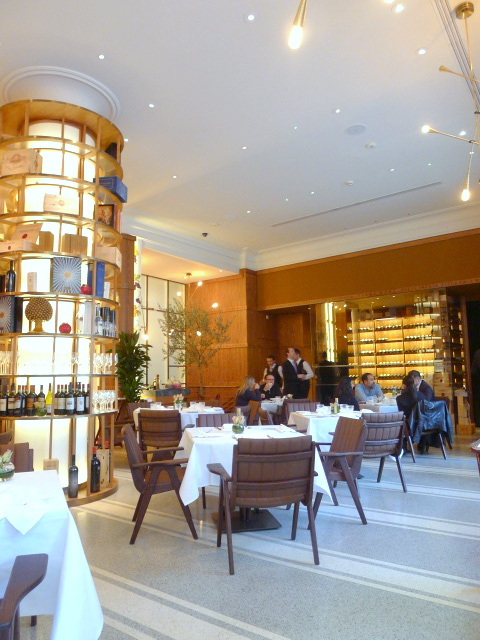 Frescobaldi is an enjoyable experience, one heightened by the incredible setting and the extremely professional and accomplished service. It’s the kind of restaurant perfectly suited for corporate pow-wows, ladies who lunch, a place to take your loved one on a date to impress. Prices: £27 to £68 for three courses, excludes drinks and service.